Homely but easy and good tofu scramble and vegetable hash was going to get its turn as fall dinner, but zucchini rice gratin from smitten kitchen and swooped in and stole the show. Life is like that sometimes. I did manage to make mine all in one skillet, plus one baking sheet. I mean, only one baking sheet fits into my oven at a time. So I didn't bother with foil at all, since you can't use foil with tomatoes. I was just extra generous with the olive oil, so cleanup wasn't really too bad and it's just the one sheet. Also as you can see I make mine with quinoa, which is faster than rice. I did make it once with leftover rice and I have some wild rice in the pantry, so that will probably happen at some point. Bring the quinoa and water to a boil right in the skillet you're going to bake the gratin in, obviously it has to be ovenproof. Cover and reduce heat to low and cook for 15 minutes. Turn off the heat and let it stand, still covered. This is actually twice as much quinoa as you need, you can put half in the fridge and then you just have to get the quinoa out of the fridge when you make this again next week. Meanwhile slice tomatoes into 1/4-inch slices, generously drizzle a baking sheet with olive oil, arrange tomato slices in a single layer, sprinkle with salt and pepper, and roast tomatoes for 10 minutes. Remove roasted tomatoes from sheet and set aside. Meanwhile slice zucchini into 1/4-inch slices, drizzle baking sheet with more olive oil, arrange zucchini slices in a single layer, sprinkle with salt and pepper, and roast for 10 minutes. Flip zucchini slices, sprinkle with a bit more salt and pepper, and roast for another 10 minutes. Meanwhile dice the onion and mince the garlic cloves. Drizzle some more olive oil in the skillet over medium heat, then add onions and saute for about 10-15 minutes until translucent or for 20-25 minutes until caramelized if you're feeling that. Add garlic and saute for another minute until fragrant. Beat eggs in a small bowl and stir in half the quinoa, onion, and a 1/4 cup of parmesan cheese. Put the other half of the quinoa in the fridge for later. Drizzle even more olive oil into the skillet, and don't worry if there are burnt on bits of quinoa and onion. 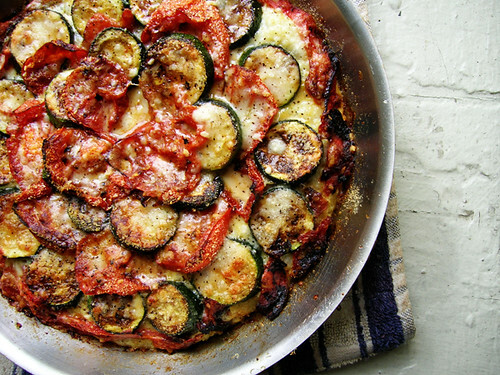 Spread half of the quinoa in the bottom of the skillet and arrange half of roasted zucchini over that, spread the rest of the quinoa over that and arrange the rest of the zucchini on top, then arrange the tomato slices around the zucchini. Sprinkle with the rest of the parmesan over everything and bake for 20 minutes until golden brown.